SS2 with active pickups is a tough act to follow for any bass. I only have the normal 7th fret g string dead spot, which somehow is not that bad anymore. I wonder, do the Mec PNut models have the same output? I've not had the chance to try the others. I know SD is supposed to be low noise. The only change I would make to mine would be making it broad neck. but damn this p-nut 1 is growing on me!!! Looks like P-Nut is using his P-Nut II signature more recently! After I got mine, I looked around for a while to see him using it, and it seemed like once he got his III, you rarely if ever saw him with the II. I know he recorded Stereolithic with his III, but he has the P-Nut II in the video for Five of Everything, and he used it during his bass solo on 3/11 this year. Of course, he could have been using it sporadically all these years and I just haven't seen it, but I watch and look for a lot of 311 stuff and only recently started seeing it out. I love the III, don't get me wrong, but the II is tops for me and since I own one, it makes me happy to see him using it more! That particular one was recently made for him out of sequence (it's not one of the original P-Nut II run) after his two II's were stolen. I do not have details of the theft, but he tweeted that to me when I asked about it. Well that's crap! I hate thieves! Glad to see another made for him, though. Do you know if the spec's are the same, or did he change some of the features? Hard to get too many details from short glances in videos, but at a glance it looks quite similar (looks like tigerwood, but could be wrong- the grain definitely isn't as defined in the recent videos than original photos I've seen, which kinda of told me something might have been up, but I chalked it up to him owning more than one of the II's.- and the black hardware, wenge neck with purpleheart looks the same). Either way, it's a gorgeous bass (as are all the P-Nut sigs...and Stage II's for that matter), and of course when I know someone has more than one Warwick, I get excited seeing them put into rotation and used. Does he ever use a P-Nut I anymore? Don't think I've ever seen that except in one of the early photos when they showed the whole band holding a bunch of them right when they were completed. OK, I read a lot in this topic and I still have a question : What version is the best so far ? I, II or III ? I am extremely pleased with my III ! I say II because chunky wenge! 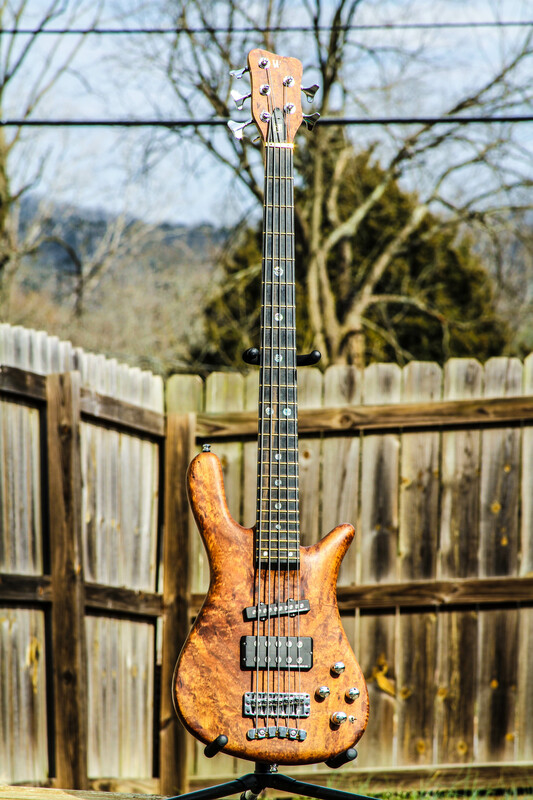 I owned this bass and then sold it. Now I've bought it back. I've said some negative things about the bass in this thread, but I'm going to see if I can do anything about the G string lacking balls. It should be here in a few days! Maybe trying a bigger string gauge for the G string...? You could do a quick test by placing the headstock against a wall, or put a small clamp on it and play the G. If it wakes up, strings won't matter. Just keep the clamp. Or just play it as is because it looks that good! Hello. I am new to this form and came across this thread. I recently acquired a P-nut III and was hoping that someone can tell me what the recommended (factory delivered) pick up height should be. I came across a few videos that mention 2 mm height for all pick ups (with the string depressed on the last fret), but I'm wondering if this would apply to a P-Nut with the Seymour Duncan's. I do understand the pick up height can vary based on your taste of tone tone but I'm looking for a good starting point. In other words, how Warwick intended it to sound. My bass is presently set up with the bridge pick up at 3 mm and the neck pick up at 4 mm. Again, Measurements were taken with the string held down on the last fret. I would also be interested in hearing what your favorite pick up height is on your P-nut. That's a good starting point. Really, once you have the string action set up how you'd like, the pickup height comes secondary and is completely arbitrary depending on the user's preference. It's kind of like sitting in a new car. The seat, steering wheel, and mirrors are there. Now you must adjust each how you like them. Sometimes with open-pole pickups, there has to be a balance between pickup height and keeping the strings from contacting the pole pieces (usually on the front pickup) when you are playing aggressively or slapping. Thanks for the advise! The neck relief and string height is perfect so I'll start experimenting with the pickups today. I'm glad you got yours back and not mine. I don't think you would have liked it nearly as much. And yes, I'm one of the 6500 on FB. Looks great bro! I would have liked yours just fine, Gerry! I would have bought it if I'd had the money you were asking at that time. It just worked out that I was able to buy one a short time later when the guy I sold it to approached me out of the blue. I'm very happy to have it back. Sometimes you don't know what you've let go until you get it back after not having it for a while. Gerry, what's your main bass now? I did just get another HB pre and am using a QSC power amp. P-Nut through this setup and my Big Cab is SO ♣♣♣♣ing clear and huge.